Known as the “charming corn village of India,” Sainji is not just a village but a unique way of life. As we wandered from one house to another, we met people from different walks of life, and discovered passed-down secret stories of the village, making this trip more than just a required activity-week outing. When we look back at this trip, it brings back wonderful memories that we will cherish forever. What struck us the most was four amazing, passionate women in the village. The way they opened up to us, sharing their stories of struggles and successes, drew us closer to them than any other person on the trip. Lori McFadyen is a Canadian anthropologist who started working in India over a decade ago. While doing research work in villages in and outside of Mussoorie, she met her husband Kunwar Singh Chohan. They got married within six months and moved to the village of Sainji. With the help of her husband, she started the Garhwal English-Medium School, which has been functioning successfully for eight years. She is the principal of this small but potent establishment, and the children call her auntie ji. She is widely loved by the kids for her kindness and compassion towards them, which cannot be seen in most schools in the region. 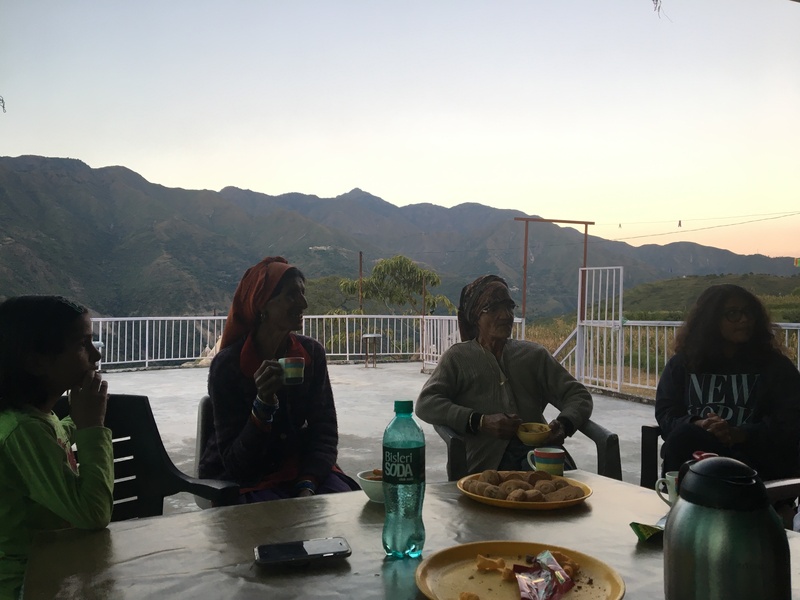 She is very hospitable and compassionate, always offering us food and chai, and asking us if we need anything and whether we were warm enough every morning. She has been hosting Woodstock students every year since the GEMS activity week was introduced. Marie: The strong and independent women. It is seven in the evening, and we have just returned to Lori’s house from a long day at school. She generously offers us some chai and biscuits, while we wait for a guest, Marie Devi, the oldest woman in the village. Marie has just had a long and busy day. I introduce myself to her. She gives me a warm hug, and pats my shoulder, blessing me. She smiles cheek to cheek; subconsciously a grin starts to spread on my face. Her smile is infectious, within a few minutes, we all end up in laughter. She tells me her story as she sips a warm delicious cup of chai, her favourite snack of all time. Some of the content shocked me despite my reasonable knowledge of the rural culture. At the age of 16, she gave birth to a baby boy. Today, at the age of 81, she is satisfied and happy, living alone in a small beautiful house with an elegant living room and a beautiful farmyard, enough to provide her with the shelter she needs. Now, she also has people around her, young children who are eager to listen to her stories, and grandchildren who she loves to play with. She cracks up when her grandson calls her, “Dadi, Dadi! (grandmother)” and it simply makes her day. As I sit next to Sunita Devi and ask about her story, she instantly bursts into tears. As if she couldn’t hold it in any longer, she explains that her husband used to be an alcoholic who came home drunk and ready to beat her. Besides getting beaten by her husband every day, Sunita had to face lots of obstacles in Sainji. However, it isn’t just her husband but also her own kids who always treated her with disrespect and cruelty. Whenever it was time for meals, her children threw away the deliciously cooked rice and dal prepared by their mother. They would support their father in beating her up with sticks and shoes. The resilience reflected by her patience at times of hardship is jaw-dropping. Today, Sunita Devi continues to live with her husband, who has stopped beating her now. She seems happy now, but she won’t be able to forget the hurt that was enforced on her by her family. It hurts to have her roll up her sleeve and show us her scars. However, she is not afraid and embraces herself confidently. But deep in her heart, she wishes she could go back in time and start all over again. When I first visited the school, I was struck by the welcoming atmosphere at GEMS. Kajal, a young girl, came running to us, excited to show us the school. You could see the love and enthusiasm in her eyes, and the sparkling smile on her face. You could tell that she was looking forward to spending the next seven days with us. A while later, as we munch on popcorn and play UNO, Kajal tells us her story. Kajal left home and chose to stay with her uncle, Kunwar Singh Chohan and her aunt, Ms.Lorrie when she was nine years old. She got the opportunity to study at GEMS, the school founded by her aunt and uncle. She visits her parents, who live in another village every month. As a grade eight student, Kajal believes that education is powerful, and has the ability to take you places. She works hard day and night, finishes her homework, takes their dog Marley for walks, helps in cooking food and manages to succeed at school. She speaks English fluently and has extra grammar workbooks to improve her language skills. She is also very passionate about math and science and is eager to perform science experiments with all of us. “I love to study. I dream of becoming a doctor or an air-hostess. Whichever career path I take, I want to be able to take care of people and help them in any way I can,” she said. It’s 9 o’clock on a Saturday morning and it’s time for us to leave. We all bid goodbyes to each other, promising to stay in touch. As I look back, I am surprised at how much we have learned from these wonderful women in just a week. The bus engine vrooms and we move ahead, but young girls and boys from the village run behind the bus, waving us goodbyes. We move past the greenery and the sky with hues of orange and yellow, I realize that it was such a worthwhile experience and I wish I could go there again.